Meet Sandra Williams – Mum, ultra trail runner, and maker of really tasty ready meals! You can now buy her meals from our freezer to heat up and enjoy in your yurt, cottage, tent or even the B & B if you don’t fancy dining out. Sandra has recently started her business, Cegin Maes Coch, from her farmhouse kitchen on the slopes of Cader Idris near Dolgellau. Sandra has been in the catering industry for 15 years. Her love of cooking started at primary school when she bought her first cookbook with her pocket money. She’s added quite a few more recipes to her collection since then! You may also find some of her rich chocolate brownies or chunks of Bara Brith – if there’s any left! Sandra buys her produce wherever possible locally including fruit and veg from Young’s greengrocers in Dolgellau, chicken, beef and lamb from Welsh farms supplied by TJ Roberts Butchers, Bala, and sausages, pork and ham comes from the free range pigs just down the road at Ynysgyffylog Farm, Arthog. When Sandra is not cooking she relaxes by training and running ultra trail running events (you call that relaxing?!). Sandra is Event Director for Dolgellau Park Run and a volunteer at Coed y Brenin Academi running club for young people. 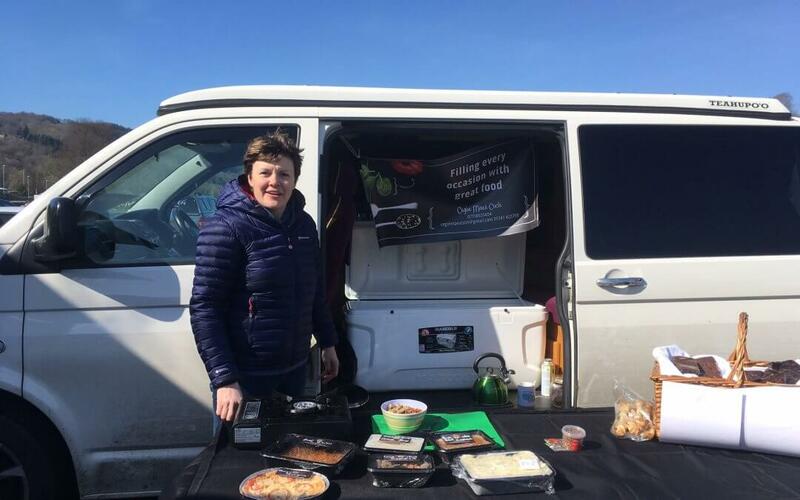 Sandra also sells her products direct from her campervan on Friday mornings in the Dolgellau Car park – go and say hello if you want to buy fresh. If you are staying with us you can purchase her meals from the freezer, and use the camp site microwave to defrost/cook or cook at your accommodation.